There is Good and there is Evil in this world. There is Right and there is Wrong in this world. Evil is wagging a war against Good. Michael and his Angels are fighting the Devil and his Angels. It is a warfare that starts in each of us. Each chose we make is a battle in this war. Will we choose to do good or to do evil. Choose you this day whom you will serve, for me and my house will serve the Lord. “My House” is not your household, but rather your body. Your body houses your soul. The Devil is in this world. He said that he is going up and down, to and fro in the Earth seeking whom he may devour. Again the Earth is not plant Earth but our Earthly body. He is going up and down in our body and going from person to person. So the battle is in us. I would do Good but Evil is present. We will win battles and we will lose battles. Let God fight your battles and you will win. As a Christian you will fight two major wars and win them both. As a non-Christian you will fight the first war until you win or die. At that point you lose. The first war is for your soul. As you come to the age of accountability, that is to know right from wrong, good from evil and accountable for your own actions, you will enter this war. This happens at different ages for different people. It occurs when you realize you will die one day and spend eternity somewhere. An event may trigger this realization. For me it was Dooms Day. Back in 1982 all the planets were on the same side of the Sun and there were Dooms day predictions. The fear was that the gravitational pull would blow up Earth. The talk and buzz got me scared. Fear of God is the beginning of Wisdom. I was only 8 years old, the age of accountability hit me. I talked to dad about it, how I was scared. He told me about God, Heaven and how beautiful it was there. He compared it to the Mill Branch. A small stream in the hills behind our house where we had been hunting just days before. It is still one of my favorite places. You could call it my Bethel. Where I first knew the Lord. I don’t believe I was ever lost or out of the grace of God. I won that war at age 8. It was any easy one for me. I just believed in Jesus. As I grew up my belief also grew. I now believe that Jesus Christ, son of God, came to Earth, borne to a Virgin 2000 years ago, preached His own everlasting Gospel, set an example for us to follow, set up sacraments to be handed down, gave His life on the Cross of Calvary as the supreme sacrifice for all sin, rose on the third day with a glorified body, was seen by many for 40 days, set up His Kingdom in the hearts of those who believe upon His name, ascended to Heaven to the right hand of God where He makes intersections for us with groanings that can’t be uttered and sent back the Holy Spirit to lead and guide us on Earth. Why are we here?, you may ask yourself. Well it isn’t about you. In short, it is to worship God. But you say he has the Angles and all the Heavenly Host to do that. Yes he does and they do it continually. But consider this, they were created to worship God and can not disobey God. They do not have freewill. We were created with freewill. So when we stop what we are doing in our lives and give God praise it is a true praise that the Angles can not give. You may say, I am a good person, why does bad things happen to me? Again, it is not about you. It is about God. When trouble befalls you, consider it great joy. Why would you do that? Here is why. If everything in our lives were easy go lucky, peace and happiness we would not feel the need of God. If we have troubles and seek the Lord for his help and receive a blessing, then we have a reason to give him praise. One story passed down about my great, great grandfather Madison Green Tibbitts goes something like this: At the age of 18, He was in the 14th Ga. Infantry. During the Battle of the Wilderness, on May 6th, he was shot through the right knee. A silk handkerchief was used to clean the wound by running it through the hole created by the mini-ball. While in the hospital he was bunked next to a Yankee named John. They became friends and keep in touch after the war. Once he was released and after the war was over, Maston took a train to Ga. He had to walk a long way to his home in Paulding county on crutches from the train station. He received a war pension for his knee, $50 a month. For two summers, he attended Bowdon College in Bowdon Ga. It was one of five Ga. colleges commissioned to provide free tuition to poor and maimed Confederate veterans. There he learned to be a cordwainer (shoemaker) or a cobbler (repaires shoes) or both. He walked from Paulding to Bowden on crutches, a distance of 60 miles one way. He was joined by Bill Sheffield and A.C. Scoggins. The Union army had destroyed everything along the route, including stores and hotels. They relied on the generosity of strangers for food and a bed for the night. One such person was Mr. Dyer in Sand Hill. They would stay with him on each trip. On his last trip home, Maston bought a heifer calf from Mr. Dyer. He drove the calf home with a rope while still walking on crutches. He was to marry Mary Ann Starnes and needed a cow of his own. This was the first new livestock to come into Paulding County after the war. Paulding was totally devastated from the live off the land campaign of the Union. Paulding had the most soldiers for the longest period of time than anywhere else during the war. Very little livestock was left. In the Spring of 1864…. March 19th according to enlistment records… my great, great grandfather, M.G. (Maston Green) Tibbitts was talked into joining the 14th Regiment, GA Volunteer Infantry, Company K (Etowah Guards – Bartow County), of the Confederate States of America by his two older brothers who’d already enlisted a few years earlier at the beginning of the Civil War. The two older brothers were James W. (Jim) Tibbitts and Thomas J. Tibbitts, and while on furlough back home in Dallas, GA, northern Paulding County, they talked the younger Maston into signing up to fight so that they could receive signing bonuses. M.G (Maston Green) was born on October 13, 1845. Private M.G. Tibbitts was wounded during his first campaign at The Battle of Wilderness, VA, May 5-7, 1864, just a few short months after enlisting. He was transported to a hospital in Augusta, GA for treatment and rehab for his battlefield wound… a mini-ball had passed relatively cleanly through the knee allowing for recovery without leg amputation. (His Confederate Pension Application reads/// “Application for Allowance for ‘Disabled Leg’. Amount $50. Entered on Record, March 29, 1894.” He walked with a limp the remainder of his life while carrying on a full and productive life raising his family and working back on the farm in Dallas, GA. Maston Green died on February 13, 1924 and is buried at Old Harmony Grove Church Cemetery, Paulding Co., GA. Older brother, James W. (Jim) was born on June 29, 1837. Corporal James W. Tibbitts served through the entire war, even having sustained a battlefield injury early on at the Battle of Mechanicsville, VA in 1862, and he also stood with General Robert E. Lee and the CSA troops at the surrender at Appomattox, April 9, 1865. (His Confederate Pension Application reads … Application for Allowance for ‘Leg Disabled’. Amount $50. Entered on Record, October 8, 1890”) He later died in 1909. James W. Tibbitts is buried at Old Harmony Grove Church Cemetery, Paulding Co., GA. These brave and honorable brothers were the sons of Joseph Chitman Tibbitts, 1812-1892, who was listed on the GA Militia Roster but never served due to his advanced age. Joseph C. Tibbitts is buried at Old Harmony Grove Church Cemetery, Paulding Co., GA.
Ecleasties Tibbitts was born to Maston Elihew and Frances Bowman Tibbitts on Aug. 14, 1905. She was their next child born after my grandfather Hollis, who was born in 1903. When she was at the age of three, the family was living in Alabama. They may have followed Frances family out there to farm. On the faithful morning, Elihew went to the barn to let out a mule from his stall. Not knowing that Little Ecleasties was near by, he opened up the door of the stall. The mule, being happy to get out of the stall, ran out kicking up his heals. The mule kicked the young girl in the head and killed her. Francis dressed her and a pine wood box was built. Wanting to take the child back home to Burnt Hickory, Elihew took her body by train to Georgia. He departed the train at McPherson, west of Dallas. He didn’t have any way to transport her so he walked to a nearby home looking for a horse and Wagon to barrow. The first person turned him down. The next person was willing to help. Word got around to family and friends. 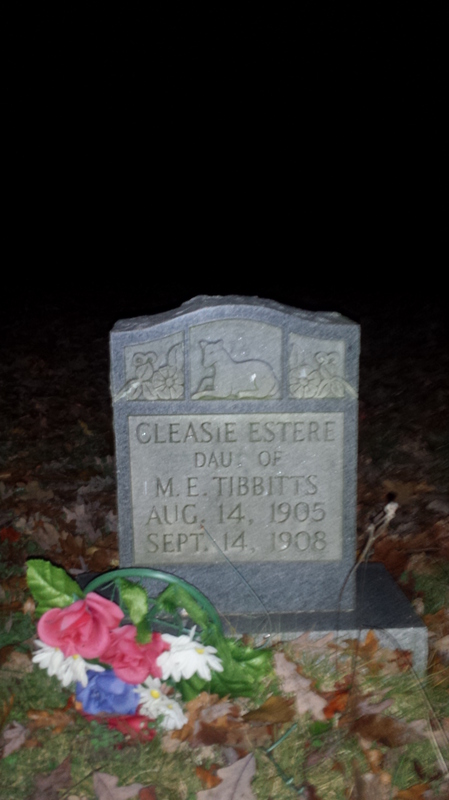 A funeral was held at Mount Moriah and Little Miss Ecleasties was laid to rest in the cemetery behind the church. She is in the back left side of the old cemetery. The Elihew Tibbitts family moved back to Burnt Hickory not to long after this happened. Elihew became a Deacon of Mount Moriah. His son Hollis and grandson Hershel were Moderator of the church. His great grandson Todd is the current Moderator.